International team of scientists, including Weizmann Institute physicists, make historic observation of super-dense stars' collision. An international research team, which included physicists from the Weizmann Institute of Science, became the first team to observe the collision of two neutron stars, the Weizmann Institute announced Monday. Neutron stars are small, super-dense stars which form when larger stars die. After the star goes supernova, the core continues to collapse until its protons and electrons combine to produce neutrons. A neutron star is so dense that a single teaspoon of material from a neutron star would weigh a billion tons. The merger of the two neutron stars was observed simultaneously by three detectors built for this purpose. Two of the detectors belong to the Laser Interferometer Gravitational-Wave Observatory, or LIGO, in the United States. The other is the Virgo detector in Italy. The team hopes that the observation will help them discover how heavy elements as uranium, iodine and gold were formed and enhance humanity's understanding of the violent events which shaped the development of the universe. The collision, which was observed on August 17, occurred approximately 100 million years ago, acording to the scientists. The LIGO detectors had previously detected gravitational waves in for the first time in 2015 after observing the collision of two black holes. The stunning discovery confirmed the existence of the waves, which were first predicted by Albert Einstein a century earlier. Three US scientists were awarded the 2017 Nobel Prize for Physics for the discovery of the gravitational waves. 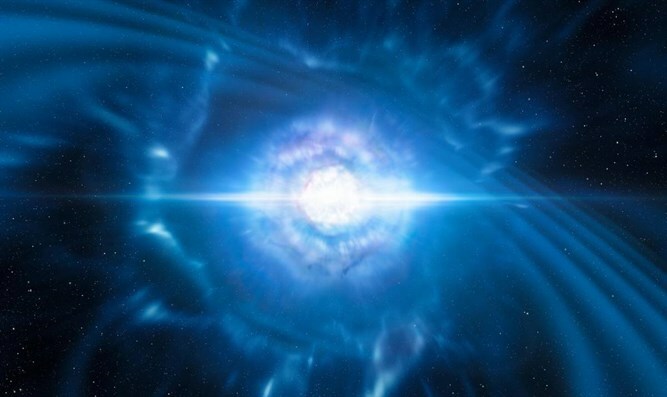 Prof. Avishay Gal-Yam, a member of the Weizmann Institute’s Particle Physics and Astrophysics Department, said that the neutron star collision would provide even more information than the black hole collision did.